CLAYSBURG — Mikaylynn Baumann drove in five runs, and Madison Knisley had two hits and two RBIs while pitching a one-hitter as Claysburg-Kimmel routed previously-once-beaten Bishop McCort, 16-0, in three innings in high school softball action on Monday. Corryne Weyandt recorded three RBIs and Haileigh Reed two for the Lady Bulldogs, who also received two hits apiece from Bauman and Raelynne Grabill. 2B–Claar, Knisley (CK). Multiple hits–Grabill 2, Knisley 2, Bauman 2 (CK). RBI–Grabill, Knisley 2, Bauman 5, Reed 2, Weyandt 3, Frye, Kennedy (CK). WP–Knisley. LP–Diamond. SO–Diamond 1, Knisley 1. BB–Diamond 10, Kinsley 1. PATTON — Emma Garrison’s three-run homer highlighted an eight-run bottom of the fourth inning for Cambria Heights, and the Lady Highlanders went on for a Laurel Highlands Conference triumph over visiting Bedford. Garrison also doubled and finished with five RBIs, while Caroline McMullen and winning pitcher Charlotte Farabaugh plated two runs apiece for Heights. Emma Stockley added two hits for the Lady Highlanders, while Bedford’s Kaitlin Brunelli doubled. 2B–Brunelli (B); Farabaugh, Stockley, Garrison, Jones (CH). HR–Garrison (CH). Multiple hits–Garrison 2, Stockley 2 (CH). RBI–Garrison 5, McMullen 2, Stockley, Farabaugh 2 (CH). WP–Farabaugh. LP–Mowry. SO–Mowry 6 (B); Lobick 1, Farabaugh 1 (CH). BB–Mowry 10 (B); Lobick 2 (CH). Records: Bedford (5-8); Cambria Heights (13-2). PHILIPSBURG — Kylie Thal homered twice, Maddie Lucas added a home run of her own, and Kam Harris tossed a one hitter in Philipsburg-Osceola’s five-inning Mountain League victory against visiting Huntingdon. Harris and Hannah Thompson each had two hits for the Lady Mounties, with Lucas driving in three runs, and Thal and Thompson collecting two RBIs apiece. Riley Confer’s single accounted for Huntingdon’s hit. 2B–Thompson, Lewis. HR–Lucas, Thal 2. Multiple hits–Thompson 2, Lucas 3, Harris 2 (PO). RBI–Thal 2, Thompson 2, Lucas 3, Harris (PO). WP–Harris. LP–Norris. SO–Harris 9. BB–Norris 5. SAXTON — Kayla Diehl threw a one-hitter and got plenty of offensive support from Lydia Mock, who went 3-for-3 with a double, three runs and two RBIs in Chestnut Ridge’s Sideling Hill League victory at Tussey Mountain. Ridge’s Payton Whysong and Samantha Baney drove in two runs apiece. Maizie Husick’s single was Tussey’s only hit. 2B–Mock. Multiple hits–Mock 3 (CR). RBI–Whysong 2, Mock 2, Dunlap, Oldham, Baney 2 (CR). WP–Diehl. LP–Barnett. SO–Diehl 2, Barnett 3. BB–Diehl 2, Barnett 3. THREE SPRINGS — Brooke Colledge and Katie Price each came up with four hits as Everett notched a win that counted in both the ICC South and Sideling Hill League at Southern Huntingdon. Sydney Reffner tallied three hits for the Lady Warriors, while Taylor Sobzack had two hits and Brittany Ewing two RBIs. Winning pitcher Jacie Martin allowed five hits. 2B–Reffner, Colledge (E); Boden (SH). Multiple hits–Reffner 3, Colledge 4, Price 4, Sobzack 2 (E). RBI–Reffner, B. Ewing 2, Colledge, Grubb (E); Boden 2 (SH). WP–Martin. LP–Long. SO–Martin 2. BB–Martin 3, Long 3. HOMER CITY — Sydney Sheredy went 3-for-4 with two doubles to help Northern Cambria down Homer-Center. Kaitlyn Kudlawiec fired a six-hit complete game for the Lady Colts (9-1). Brianna Lieb drove in two runs. MARTINSBURG — Lexy Rogers pitched a three-hitter with eight strikeouts and three walks in Bellefonte’s win at Central. Hanna Lauck led Bellefonte with two hits and two RBIs. Ashley Negley had two hits for Central (11-7). 2B–Smith, DeHaas (B). Multiple hits–Tice 2, DeHaas 2, Lauck 2 (B), Negley 2 (C). RBI–Lanck 2. WP–Rogers. LP–Claycomb. SO–Rogers 8, Claycomb 4. BB–Rogers 3, Claycomb 3. 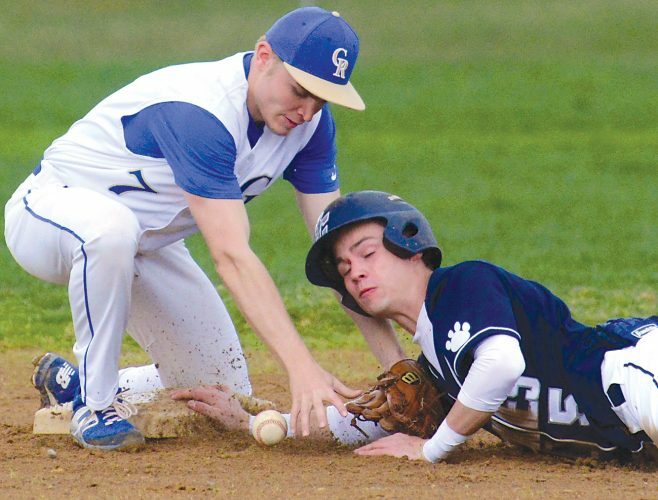 LOYSBURG — Northern Bedford scored once in the sixth and twice in the seventh to tie it up, but Fannett-Metal came up with three runs in the top of the ninth to emerge with the ICC South/Sideling Hill League victory. Brittany Ebersole delivered two hits, a double and and RBI for Northern Bedford, which also got a double and an RBI from Madison Johnson. Jamie Adams drove in three runs and Kassie Holtry two for Fannett-Metal. 2B–Ritchey, Adams, McClure (FM); Ebersole, Johnson (NB). Multiple hits–Adams 2 (FM); Ebersole 2 (NB). RBI–Adams 3, Holtry 2 (FM); Ebersole, Lingenfelter, Johnson (NB). WP–Holtry. LP–Heck. SO–Holtry 8, Heck 2. BB–Holtry 5, Heck 5.